Opening Night Set for the Sanford Performing Arts Center! The historic opening night at the new Sanford Performing Arts Center is Monday, December 17 at 7:00PM. 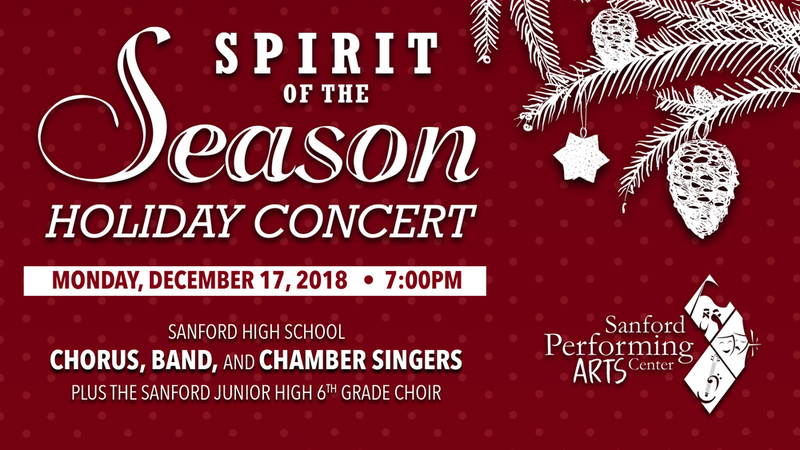 The Spirit of the Season Holiday Concert will feature the Sanford High School Band, Chorus, and Chamber Singers, plus the Sanford Junior High 6th grade choir. The program includes best-loved holiday classics, and will culminate with a festive singalong with the band, the choirs, and the entire audience! This performance is a free, non-ticketed, general admission event. Doors open at 6:30pm. Attendees should use the evening entrance at the new Sanford High School (the large glass entry which faces Alumni Stadium).